Image above: The Mahabharata (Great India) epos has enhtralled Indians for thousands of years with its dramatic saga of struggle between good and evil centering on its protagonist in excelsis Lord Krsna, the Taraka Brahma of the era. The above rendering in medieval style displays the scene when Lord Krsna expounds the timeless teachings of the Bhagavad Giita, a part of the entire ancient epos, to Arjuna at the battlefield before the final war commences. The philosophy of Ananda Marga can be explained in a very simple way through a cycle called "Brahma Chakra". Shrii Prabhat Ranjan Sarkar said that God has two defects. First, God cannot create another God and second, God cannot dislike or hate anybody, whether one is a thief, robber, murderer, good person, bad person, etc. Before God created the universe, He was all alone. He was in a Nirguna (non-qualified) stage. This stage of God is known as the "Nirguna Brahma". One can easily imagine the tortures of loneliness when one is all alone.God, thus, created the Universe out of his thought projection, known as "Sagun Brahma" (qualified greatness) or "Prakriti". Thus, God is no longer alone now. He enjoys playing with His creations.This play with His creations is called "Liila" in Sanskrit. The Universe is the stage of His own show in which He is the Generator, Operator and Destroyer (GOD). God is also known as "Paramatman" or the collection of souls. Literally, God is the ocean of souls. Our soul is known as atma or the unit soul which is ever longing to merge into the Paramatman just like every drop of water is ever longing to merge with the mighty ocean.Therefore, Dharma in real sense of the term is the journey of the Unit Souls to merge into Parmatman just like dharma of every drop of water is to merge into the ocean. Each individual, whether its a human being, animal, or plant is a soul with a body around it. Shrii Shrii Anandamurtiji said that we have attained the human form after many rebirths from lower forms of life not by our own efforts but through the efforts of Prakriti or Sagun Brahma. Sagun Brahma helped us to attain human form in order to do spirituaĺ practice under the loving guidance and shelter of Taraka Brahma to merge back into God or Brahma or Paramatman and thus attain Absolute Bliss. This can only be possible when we surrender ourselves to Taraka Brahma or Parampurusha. The definition of Taraka Brahma is that he is/was a person like us. But, unlike an ordinary person's brain which utilizes only between 1-2 % of its full capacity, a Taraka Brahma's brain function cent per cent. A mahapurasha (a great man who bring great social revolution)'s brain function at between 10-20 % of its full capacity. Anandamurtiji said we can raise the percentage of our brain-functioning to higher levels by sadhana (meditation). Anandamargis believe Sada Shiva, Lord Krishna and Shrii Shrii Anandamurtiji were Taraka Brahmas in the three Yugas, which passed after human beings evolved. Sada Shiva was born 7000 years ago, Lord Krishna was born 3500 years ago, and Shrii Shrii Anandamurtiji was born in the 20th century. Shrii P.R.Sarkar said, "Avatara" means "descending" to come to form of a "unit". Every person, animal or plant is an Avatara of Paramatman. But the advent of Taraka Brahma is known as "Mahasambhuti". He said that during a period when the "Papis" or evil beings become too dominant in the society and the "Oppressed" are exhausted of all means to fight the Demons or Evil, the Law of Dharma compels Paramatman to descend down to the society in the form of an ordinary man but having immense supernatural powers in order to regenerate and maintain balance in the society. The Taraka Brahma does this by revolving the wheel of "Yuga" or "Age" to the appropriate era by applying tremendous spiritual force in order to uphold Dharma or Righteousness. That is why Lord Krishna had to stage the "Mahabharata" in order to give victory to the Pandavas who were on the side of Dharma against the Kauravas. 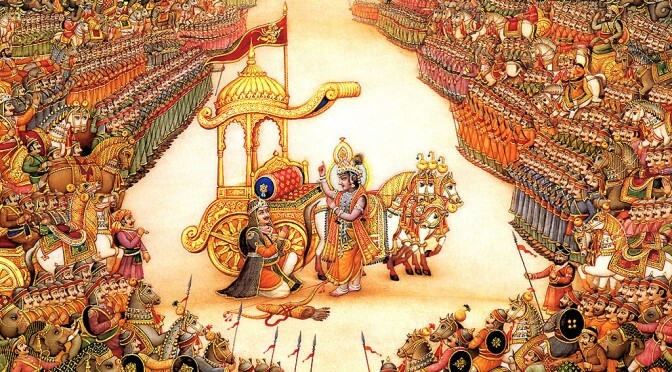 This Epic Battle of Kurushetra in which many a great hero and thousands of soldiers from both sides laid down their lives is a vivid reminder to mankind that God is compelled to side with the oppressed in order to uphold Dharma or Righteousness in any of the four Yugas or Ages revolving on the wheel of time.